Traditional Battenberg — What the Fruitcake?! When Lis e-mailed asking if I'd mind stepping in to host the June challenge I was so excited. It’s not over-complicated, uses simple ingredients, doesn’t take an age to do, but, I think it’s a classic that has a certain whimsical quality, and something that can be loads of fun. There was definitely room for creativity here! Funny enough, before making this cake for the challenge, I hadn’t eaten a single crumb of a Battenberg. But whenever one caught my eye in the store, I couldn't help but look at it with a smile. There’s something about the checkered squares in yellow and pink that makes me think of tea with Alice at the Madhatter’s, or a little girl serving out slices to her teddy bears on little plastic plates. This cake has far grander beginnings than tea with teddy. It was actually created as a wedding cake for royalty. The first Battenberg cake was made to celebrate the marriage of Queen Victoria’s granddaughter, Princess Victoria, to husband Prince Louis of Battenberg. 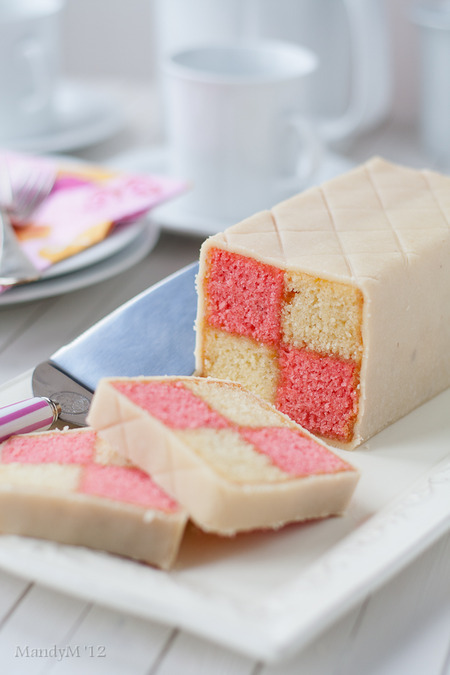 It’s traditionally flavoured with almond and has the signature Battenberg markings, that is, the yellow and pink squares (said to represent the four princes of Battenberg). The strips of sponge are glued together using jam (normally apricot) and the whole cake is covered in marzipan. Sometimes the edges are crimped and the top is patterned with a knife. Being that this recipe is thoroughly English, I thought it would be appropriate to use a recipe from a fantastic English baker, Mary Berry. (Don’t you just love her name?). This traditional Battenberg recipe comes from Mary Berry’s “Baking Bible”. It’s an all in one cake method, so very simple, quick and very few dirty dishes! Although there are specialised Battenberg cake tins available, you don’t need one. This can be baked in a square baking tin and a divide made with foil to separate the two batters. This recipe really is all about simplicity. The challenge was to make a Battenberg cake. It had to be in the traditional shape (square oblong) and had to have at least two different coloured checks as well as be covered in a firm edible covering like marzipan. But, the DBers could choose any flavours, and even do more than two colours. I encouraged everyone to use marzipan, but I know many people don’t like marzipan at all, so also on option was to use rolled fondant or chocolate plastique to cover the cake. The Daring Bakers could also use buttercreams, curd, ganache etc instead of jam to glue the cake together. Lisa, my baker in crime over at Parsley, Sage, Desserts and Line Drives (she called herself my "sidekick" for this, I guess that makes me Wonder Baker? Cake Woman? Something cool anyway ;) ) had an amazing Battenberg lined up but came head to head with the Evil Lord Humidity, which unfortunately thwarted her arsenal of batter and marzipan. It brought to light dealing with the same baker unfriendly weather. So, a few tips when working with marzipan/fondant/chocolate plastique in humid and hot weather. Firstly, keep it cool. It does need to be pliable, but it won't hurt to chill it just slightly to help keep your covering from "melting" and becoming too sticky to work with. You do need to knead it to get it ready for rolling and covering but try to handle it as little as possible as soon as it's pliable enough, and if you need to, roll out the marzipan in between sheets of parchment paper and use plenty of corn flour or powdered sugar on your rolling pin, hands, surface etc. I've adapted Mary Berry's recipes quite a bit in terms of quantities 'cause I found the amount of batter to be too little for an 8"x8" (20cmx20cm) cake pan, once the sponges were trimmed the strips were a bit on the slim side. The amounts provided are perfect for an 8"x8" (20cmx20cm) tin. However, if you do have a Battenberg pan (8"x6") (20cmx15cm) then you will have some leftover batter. Just fill your Battenberg tin to 3/4 full and that should be enough for the batter to rise above the top of the pan which you can then trim off. If you want to add a flavour to one of the sponges in liquid form, make sure to add the same amount of liquid to the other batter in the form of milk. The batter is very thick and should be quite thick so don't add too much. You'll see an example of this in the Walnut & Coffee Battenberg. I've included links at the end of the post for home made marzipan as well as chocolate plastique/modelling chocolate. Also at the end of the post is how to make your own self raising flour. Posted on June 27, 2012 by Mandy Mortimer and filed under Baked, Daring Baker, Sweet and tagged Almond Baked Battenberg Cake Daring Baker Marzipan Sweet.